Heute habe ich diesen tollen Blog Candy von Andrea bekommen. Vielen Dank für die schönen Sachen!. Nun bin ich an der Reihe Blog Candy zu vergeben. Und zwar werde ich an die ersten 3 Leute, die auf diesen Beitrag antworten ein paar Goodies verschicken. Diese 3 müssen dann ihrerseits auch wieder an 3 Leute einen Blog Candy vergeben. 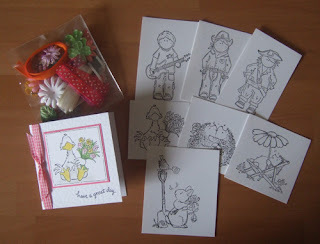 Today I recived this lovely blog candy from Andrea. Thank you for the great images (especially the rocker and the Cowboy, I am so desperate to buy them on Funkykits, but they are never in stock ). Now it's my turn to send out some blog candy. I will do this to the first 3 people who reply to this post and then you are supposed to send PIF candy to another 3 people. me me me me if you ok with sending to uk? Ying from Malaysia:-)) Hope to receive mail from Europe :-))I want to play.Thank you. well too late! but not to worry as I'm just in the process of sending out some PIF candy myself - isn't it a fun thing to do!